A student practices at a training hosted by SafeShot. CHICAGO — A spike in demand by city residents saw the state issue 63 percent more permits to Chicagoans to own a gun in 2016 than in 2015, according to data obtained by DNAinfo from State Police. In 2016, some 38,712 Chicagoans got a state-issued Firearm Owners Identification card compared to 23,725 in 2015. About 212,000 people are licensed to own a gun in Chicago, according to State Police. The number of Chicagoans allowed to own a gun has been on the rise since 2015, when it jumped 21 percent from 2014, according to the State Police. In addition, there has been a surge in the number of Chicagoans who obtained a permit to carry a concealed gun under a 3-year-old law, jumping 50 percent — from 13,948 in 2015 to 22,517 in 2016, according to State Police data. Gun instructors across the city report their training classes are packed with aspiring pistol packers. The State Police Firearms Services Bureau warns applicants on its website to be patient while waiting for their identification cards because the bureau is "is experiencing a record number of [ID card] applications each month." Joel Ostrander, the owner of SafeShot Ltd., which provides training, said he has seen a huge number of students from Chicago who want to learn how to handle a gun — and they all tell the same story. "People are worried about crime in Chicago," Ostrander said. "These are well-educated, professional people looking for a way to protect their homes and families." More than 730 people were killed, and more than 4,000 people were shot in 2016 in Chicago — the highest tally since Chicago’s poorest communities were ravaged by crack cocaine and violence in the ’90s. Chicago Police Department spokesman Anthony Guglielmi said few guns legally bought are involved in criminal activity in Chicago. "Our issue is with illegal guns and repeat offenders who use them to engage in violence," Guglielmi said. Edison Park and Norwood Park in the northwest corner of the city and Morgan Park and Mount Greenwood in the southwest corner have the highest per capita number of permitted gun owners, according to the data. Clearing is home of the highest total number of gun owners with permits, while Dunning is home of the highest total number of Chicagoans with concealed-carry permits, according to the data. Austin and North Lawndale, two of the city's more dangerous neighborhoods, had permit and concealed- carry numbers far below the city leaders. To legally buy a gun, ammunition or a stun gun in Illinois, you must have a firearm owner's identification card issued by state officials after they collect a $10 fee and conduct a background check meant to prevent those with criminal histories or mental health issues from getting a gun. 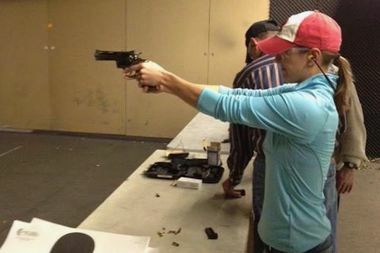 Sixteen hours of training are required, including three to four hours practicing at a gun range, to obtain a concealed-carry permit, which costs $150 and is good for five years.